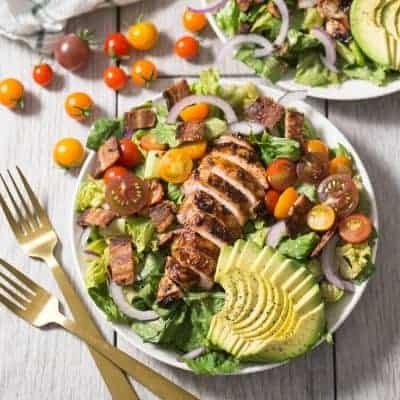 Paleo + Whole30 Chinese Chicken Salad Recipe with a homemade salad dressing. 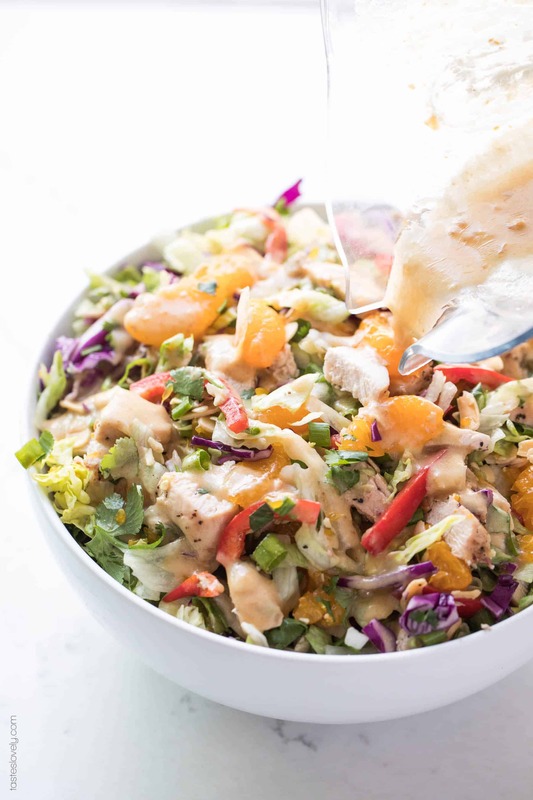 Delicious and healthy 30 minute asian chicken salad recipe with favorites like cabbage, cilantro and mandarin oranges. Gluten free, grain free, dairy free, sugar free, soy free, low carb, clean eating, real food. 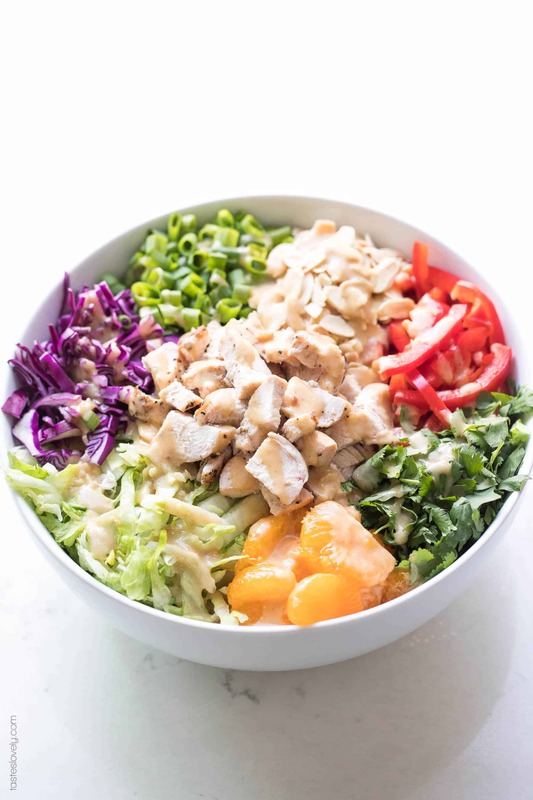 REALLY freaking out over this Paleo + Whole Chinese Chicken Salad recipe. If you know my husband at all, you know he is 100% obsessed with Chinese chicken salad. His favorite version is this Ramen Noodle Chinese Chicken Salad. His mom made it for him growing up, and he can’t get enough. It’s the only salad recipe he requests, which is saying a lot because he is such a meat and potatoes kind of guy. 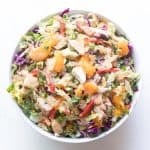 I just made a few tweaks to the original version to make and even healthier paleo + whole30 chinese chicken salad. First, I had to get rid of the ramen noodles. No way around that. But, I added in even more sliced almonds so you still get that great crunch. I used the same salad base of iceberg lettuce, cabbage, red onions, scallions and cilantro with chicken breasts. Next was perfecting the salad dressing. 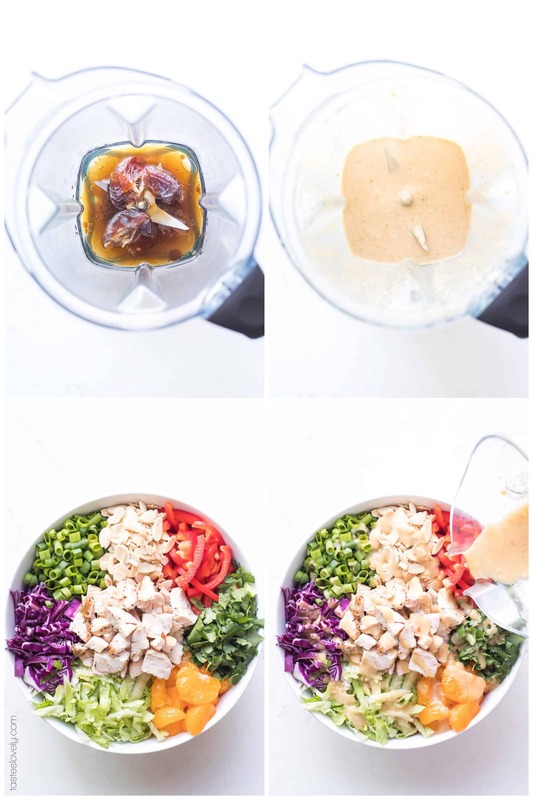 The original version used soy sauce and honey, but I knew I could find a way to make a delicious whole30 chinese chicken salad dressing. I swapped out the soy sauce for coconut aminos, and the honey for dates. You guys, I can barely tell the difference! I added in a little more salt, since coconut aminos isn’t as salty as soy sauce. And I made the dressing in the blender to really pulverize the dates. It is so delicious! Last, I added in some mandarin oranges just for fun. 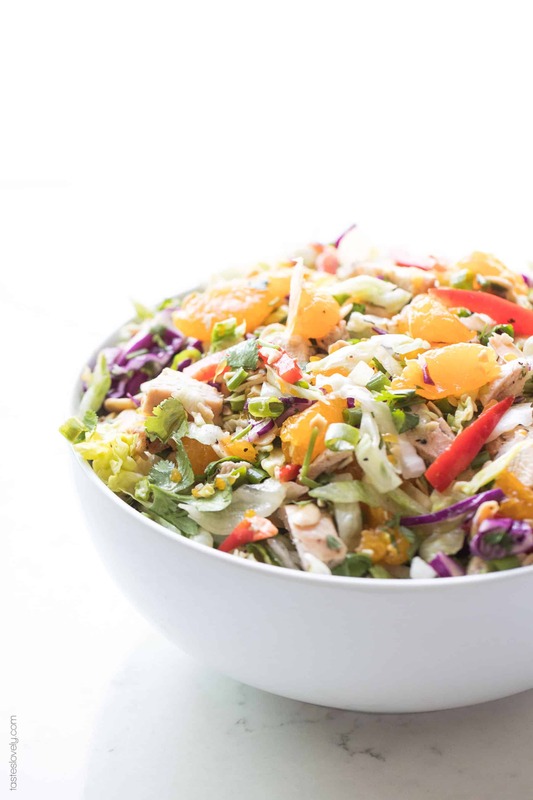 I’ve always loved citrus in my chinese chicken salad. Adds more brightness and the citrus is a great addition to all the other flavors. Be sure you read your label to make sure your mandarin oranges are packed in 100% fruit juice. I love using these mandarin oranges. I’m just so happy to have a healthier paleo + whole30 chinese chicken salad recipe that the whole family loves. When I serve it to my 2 year old, I serve it “deconstructed style” with a pile of the grilled chicken, some mandarin oranges, a pile of sliced almonds, and some of the dressing he can dip everything in. He is a happy camper. And so am I since these salad is so dang healthy! Paleo, whole30, gluten free, grain free, dairy free, soy free, sugar free, clean eating, real food. Preheat oven to 350ºF. Line the rimmed baking sheet with parchment paper. Lay the chicken breasts on the parchment paper, drizzle with olive oil and season with salt and pepper. Roast in the oven until the chicken has an internal temperature of 165ºF, about 20 minutes. Remove from heat, rest for 10 minutes, then chop the chicken into bite sized pieces. 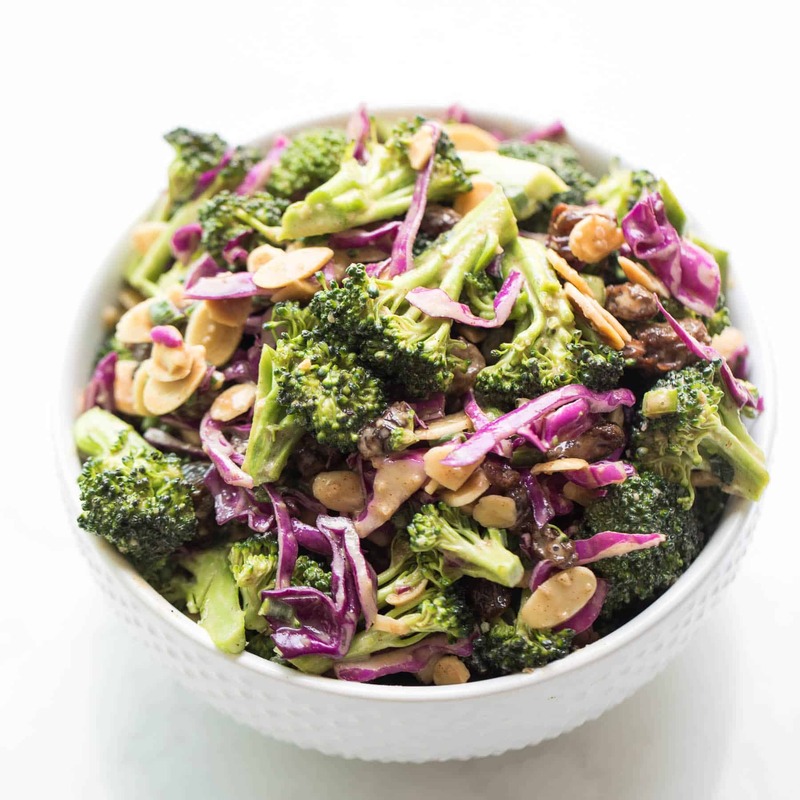 Make the dressing by combining the avocado oil, rice wine vinegar, coconut aminos, pitted dates, sesame seed oil and salt in your high speed blender. Blend on high for 1 minute, until the date is fully chopped and the dressing is well blended. 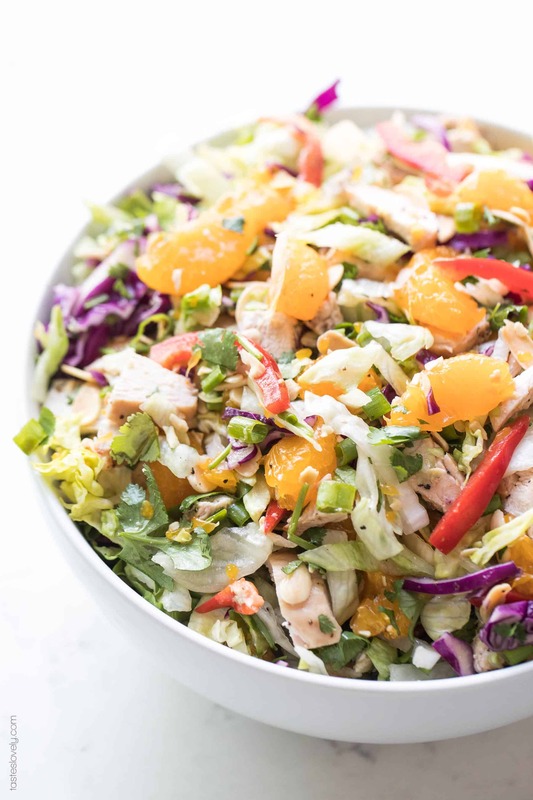 Make the salad by adding the iceberg lettuce, cabbage, cilantro, red bell pepper, green onions, mandarin oranges, almonds and chicken to your large salad bowl. Top with desired amount of dressing, toss and serve. Make sure your dates you are using for the dressing are very soft and plump. If they are dry and hard, soak them in hot water for 10 minutes to soften them. They will blend much easier. If it works for your diet, you can substitute 1 tablespoon honey for the pitted dates in the dressing. Just tried this salad yesterday and LOVED it! So yummy, and I loved how you used dates as the sweetener for the dressing! Hurray! I’m so glad you liked it Chelsey! You just made my day! Where can I find the nutrition information on your recipies? I calculate all my nutritional information on myfitnesspal.com! Best to do it with the exact ingredients you use so it is the most accurate. 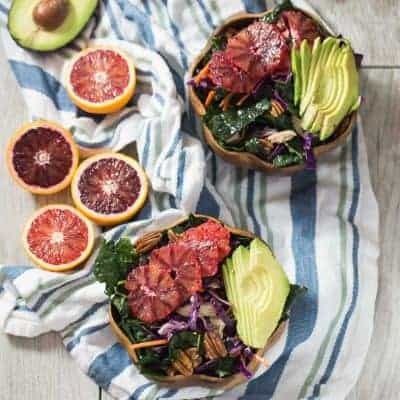 You are going to LOVE this salad! So glad you enjoyed it Sherry! It’s one of our favorites! Thanks for letting me know you liked my recipe. This comment made my day! My kids (6 and 7) have asked for this for lunch everyday this week, and I haven’t minded at all. This is SO delicious!! Thank you so much for the amazing recipe, I’ve had the hardest time finding sauces/dressings that made Whole 30 easier to do as a family (not that the kids need to, it’s just easier to cook one meal), and this is just what we needed. I can’t wait to try more of your creations! I love hearing that! Kids asking for salad?! What a mom win! Thank you for letting me know you liked my recipe. And that your kids did too! You made my day! 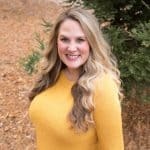 Rooting for you on your Whole30!